When Book Club Girl started the Meg Cabot Read-Along, I knew I wanted to participate! 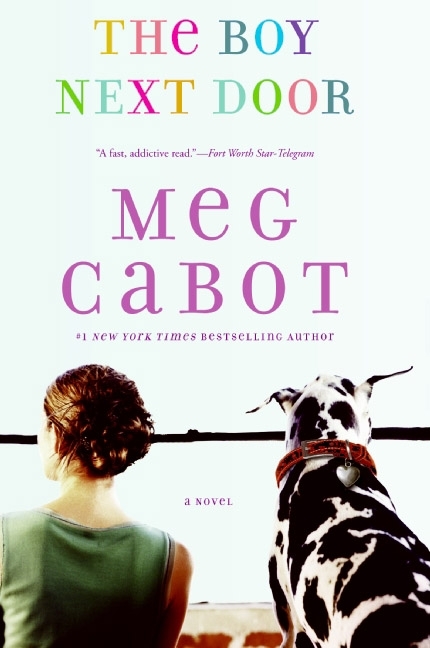 Booking Daughter has been a long-time fan of Meg Cabot's -- you might remember my dilemma at BEA a few years back when I couldn't get an ARC of her latest middle grade book; and I absolutely loved Ms. Cabot's energy and humor when I heard her speak. Booking Daughter read all of the Allie Finkle books when she was younger, and now she's determined to read every single one of her Princess Diary books. I figured that while Booking Daughter is working her way through the Princess Diary series, I could participate in the read-along, and we'd just have a big Meg Cabot love fest in our house this summer. When I sat down to read the first read-along book THE BOY NEXT DOOR, it dawned on me that I've only read Meg Cabot's books for kids. I really can't remember ever reading one of her adult books, and that's really surprising to me because I used to read a lot of chick lit. Needless to say, I was excited and I had a feeling that I was in for a treat. And THE BOY NEXT DOOR was a treat. It was highly entertaining and a great way to escape from life's little problems for a few hours. I was a bit surprised when I opened the book to see that the entire novel was written in the form of emails. In the past few years, I have read a few books that used this technique (i.e. HOLLY'S INBOX), and I find that I enjoy the quick pace of the story. (For some reason, reading emails comes very easily to me -- could it be that I read a lot of emails every day?) I love the way the characters interact in the email messages and I found it ironic that many of their exchanges took place during work hours on work computers -- much like real life! THE BOY NEXT DOOR tells the story of Mel, a single woman who writes as a gossip columnist for a New York City newspaper. She aspires to write "real" stories as well as meet to meet Mr. Right, but she seems to be in a bit of rut.. until the elderly woman who lives next door is almost murdered. The woman's "nephew" moves in to help take care of the pets, and Mel finds herself very attracted to him. When Mel discovers that neither the crime nor the nephew are what they first appear, she realizes that she has to uncover the truth and get to the bottom of both stories. One thing that really stood out to me about THE BOY NEXT DOOR was just how funny it was. I'm talking laugh out loud funny in certain places. Of course that shouldn't come as a surprise to me since Meg Cabot is a hoot, but I think she's especially effective at incorporating humor into her books. There were a few scenes that were hilarious, but I also appreciated the more subtle humor that took place in the characters' day-to-day lives. For example, I thought come of the characters' insecurities were very funny because they were so real; and the insanity of the office politics was spot on! Another wonderful thing about THE BOY NEXT DOOR were the characters; and by that I mean almost all of them -- even the ones who weren't exactly likable. Naturally, I adored Mel and wanted to her find some happiness in both the professional and (more importantly) personal aspects of her life. However, I also found myself really enjoying the scenes (emails?) with Mel's friends, especially Nadine. Nadine was getting married and had a constant battle with her weight; and I think many women will be able to relate to some of her statements. Furthermore, I liked Mel's love interest and I appreciated that the book included email exchanges between him and his family. In addition to all of the romance and confusing plot twists, there was an "almost murder" mystery in the story. It wasn't a major part of the story but it was definitely an important plot point because it set all of the events into motion. I won't say that the reveal of the culprit came as a surprise to me because it was fairly obvious to the reader that the initial suspect wasn't guilty of the crime, but I did enjoy how the "criminal" was eventually caught. Overall, THE BOY NEXT DOOR was a very funny read and a great summer escape book. Recommended for fans of chick lit! I read this book as part of Book Club Girl's Meg Cabot Read-Along! I don't think I've read any of her adult books either! I read a couple Princess Diary books with my niece, when she was the right age. You and Booking Daughter are going to have a wonderful Meg Cabot summer. I don't think I've read any of Cabot's books at all and this one sounds like exactly what I need right now! I haven't read any Meg Cabot, but I just picked up her vampire books. I tried reading one of Cabot's adult books and left it after trying a lot. It just did not work for me. This sounds like a good one though. I prefer her adult books, they always have some sort of email exchange format that I really enjoy. I love this book and actually all of the books in this trilogy so much! Partly because I love books told through emails, etc. and partly because I love Cabot's humor so much. It does sound like a fun read. The only ones of hers that I've read are the Princess books. 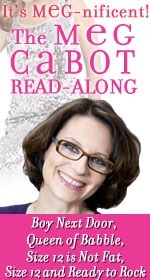 Meg Cabot is just so prolific! I *have* read a couple of her adult books, and loved some and didn't love some others. But she definitely has appeal, and I *liked* even the ones I didn't *love*!